When it comes to reviewing plushies, it can be a tricky thing, people usually take a quick look at them and their mind is made up as to if they’re cool or if the phrase ‘Do Want’ pops into mind. In this case, the popular reaction was a mix of ‘D’aww’ and ‘Oh that’s adorable!’ But with being cute comes a bit of a price. With imports from Japan sellers hitting as high as £60-£70 and prices on ebay sometimes going over the £100 barrier, we have to ask, is it worth it? The initial idea isn’t as absurd as you may first think, the company behind Hello Kitty (Sanrio) have often partnered up with other companies and franchises to make cross over items with their cuddly kitty. As for Sonic, he’s also not a stranger to cross overs, anyone remember that Be@rbrick figure from late last year? The plush is one of the largest plushies I’ve seen in recent times. Not just the fact it’s tall, the mass in general is quite enormous. When they said it’s a ‘jumbo plush,’ they weren’t kidding. The mass of the plush is so great I can’t accurately provide measurements for you, but to give you idea, it’s around the size, if not slightly larger than the Sonic Generations Collectors Edition box. If you intend to put this on display, you’re going to need to make a lot of room. 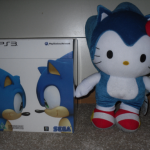 Everybody who collects Sonic merch will likely have a ‘favorite plush’ even if they don’t own it. 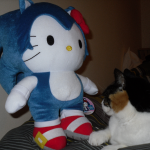 Not to long ago I was fortunate enough to hold some the Sonic Adventure 2 plushies, considered by many to be the ‘best’ plush line, it’s debatable, but they’re mentioned time and time again. Reasons are many, usually it’s the look, the quality, the build, just the fact that they’re so accurate to the characters and the quality of the plush is so high. 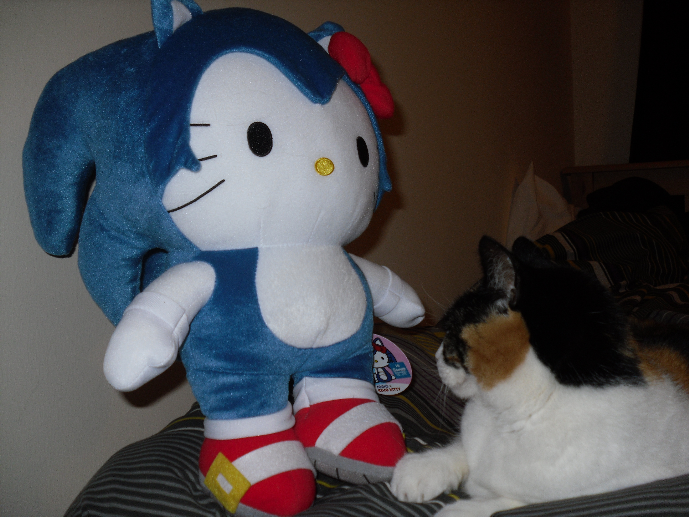 The Sonic X Hello Kitty plush is up there with those plushies in every respect, if not more so. The build quality of this plush is fantastic, it’s stuffed very well but it’s still huggable, by that I mean, it’s very well padded out, but it still has some give meaning you can hug it and it feels comfortable to do so. The stitching/seams also seem strong, but they’re small and not noticeable unless you’re actively looking for them. Detail is another thing which this plush scores high with. 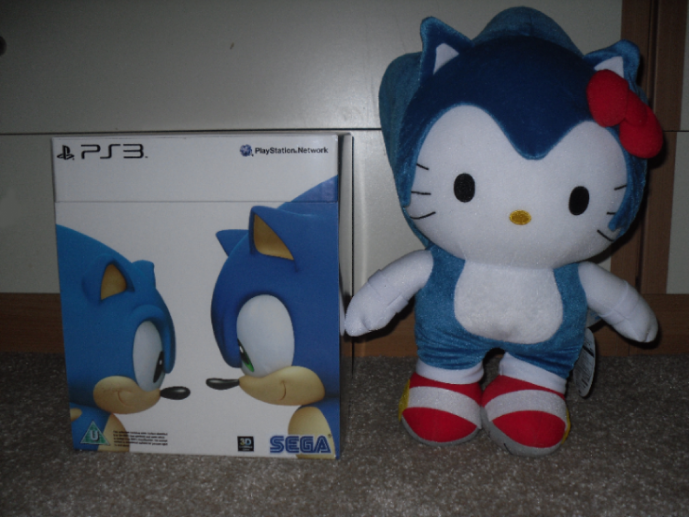 Ok so it has one disadvantage to other plushies, that being, it’s not a Sonic plush, it’s a Hello Kitty Sonic hybrid. But that doesn’t mean it’s not detailed, it’s little things. 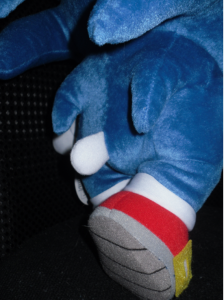 For instance, on the soles of the shoes, you’ll find the sole patterns from Sonic’s shoes, you’ll find the yellow buckles and the strap in the right place held securely. We all know Sonic wears gloves right? Well Sanrio have added one extra detail which is very clever design, instead of gloves, they’ll added a small strap around each wrist, which gives the illusion of gloves, and it works doesn’t look cheap or lazy, it looks like it’s wearing gloves. 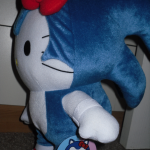 Other bits of detail I love would be Sonic/Hello Kitty’s tail, Sonic as we all know has a small tail, only instead of it being present on this plush, Hello Kitty’s tail is in the place instead, giving the appearance that Hello Kitty is wearing a Sonic costume as apposed to it being some kind of hybrid… it also looks extremely cute too… d’aww. For the Hello Kitty enthusiast, the hallmark characteristics are there, the yellow nose, the dark eyes, the whiskers, even the red bow makes it on the design. 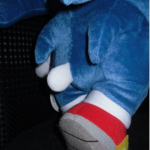 So that leaves us with a question, is this a Sonic plush? 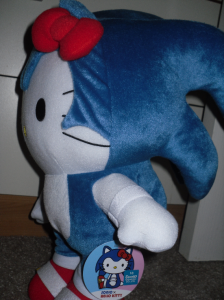 Strictly speaking, not really, it’s Hello Kitty wearing a Sonic costume, but you’d need to be quite cynical to say it’s not a Sonic plush, it is that. To bring back the Be@rbrick figure, is that Sonic? No. Is it a piece of Sonic merch? Yeah. Same thinking applies here. It’s a Sonic plush. As for it’s place in the line of many plushies that have come before and since. This one is going to take some beating when it comes to quality, no really, it’s one of the best and I’ll try to explain why. When a new line of Sonic plushies are announced, the company will attempt to make a ‘design’ or ‘blueprint’ which is then used or all future products from that company. An example of this would be Jazwares, take a look at their original mini plushies, then compare it to the 20th anniversary mini plushies, exactly the same, except for the colour. Now sometimes they get it spot on first time (PMS Inernational & Impact Innovations for instance), however when they get it wrong, it can take a long time for a new design to become standard. Sanrio, have been making Hello Kitty merchandise for a very long time, the design is very good, and there is a clear defined build process. Hello Kitty plushies, even if you don’t collect them are top quality plushies. So for this plush, it’s following Sanrio’s very careful and specific design sheets. It’s high quality because it follows their hundreds if not thousands of Hello Kitty pieces of merch that have come before. The Sonic aspects are extras which have also been built to their high standards. The result, one of the finest Sonic plushies I’ve seen for a long time. What’s the verdict? : If you havn’t guessed, if you describe yourself as a collector, I would definitely recommend this. The quality is exceptional and the size of it means it’ll look great on display. For people who just want to play with it, it makes a great toy. 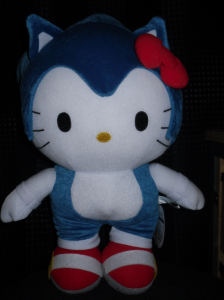 Be you a Sonic fan, or a Hello Kitty fan, it’s very hard to find fault with this. At best I can only think of ‘it won’t stand up on it’s own, nor can it sit up on it’s own.’ but this is due to it’s size and the fact it’s so well stuffed. Should you buy it? : Oh boy, this is a difficult question. Being exclusive to Segas Joypolis arcade, if you are going to Japan and heading to the arcade… YES! However, the sting is that you have to win it from either a UFO catcher or a token trade in game. So if you’re very lucky, win one. However, most likely you won’t be going to Japan, which means… online auctions. Buying from a Japanese Auction? This can be very expensive unless you intend to buy a lot of things from japan in the future. When you take into account shipping fees, you’re looking at prices of over £60 at least. And that’s without thinking about a possible customs charge on top of that. This leaves you with ebay… and the costs for that will be even higher. Prices tend to hit the £90-£100+ mark. So it depends on you, I for one do not regret getting this via a Japanese auction. If you have the money and you can find a very good deal like I did, definitely pick this up, I don’t regret buying this at all. Otherwise, there may still be a bit of hope. 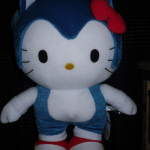 Sega have said that they want a selection of Sonic X Hello Kitty merchandise to be available worldwide by summer of 2013. Maybe we’ll see them in western markets? Whilst it may not be this specific design, if Sanrio are making them, you can bet the quality will be exceptionally high and they’ll be available in lots of stores. Still not sure? Be sure to check out this video that shows off the plushie in more detail. Great for any sonic merchandise collecter i say! It’s too cute aswell. That tail is just “D’awww”. I laughed at the picture with the plush and the cat! So cute! Is that your cat Hogfather? Aaaah, it’s just so cute!!! kinda fruity if you ask me. Questionable to a guy that owns one, even a collector. I managed to get this plush at a convention I went to for around $45. Still, you’re very right. It is very cuddly. So I totally bought it lol. Actually, I have Sonic Stadium’s previous article to thank for making me notice it. Haha.